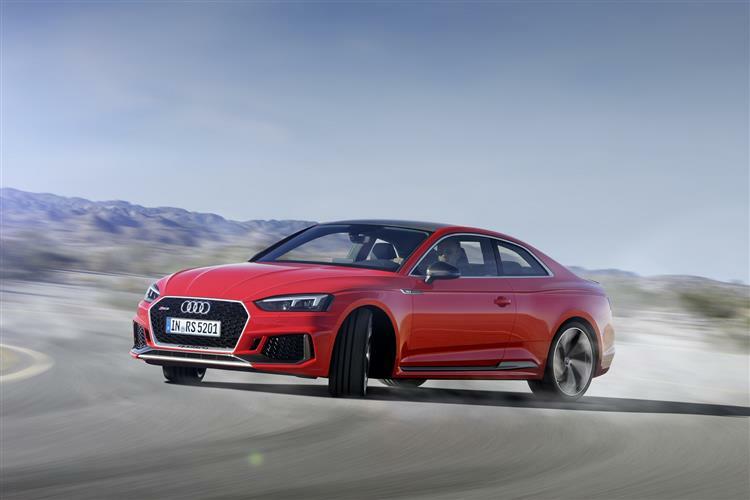 Audi's RS 5 performance coupe targets BMW M4 and Mercedes-AMG C63 buyers. Jonathan Crouch checks out the latest version. 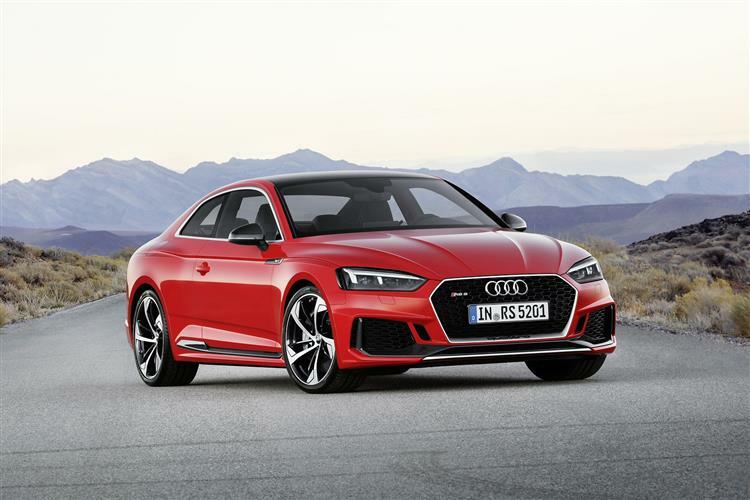 With a 450PS 2.9 TFSI V6 biturbo engine under the bonnet, Audi's RS 5 has plenty of firepower, plus quattro 4WD to give it an advantage over similarly quick BMW M4 and Mercedes-AMG C63 rivals. The original version of this model didn't quite create the impact Ingolstadt was hoping for, hence the need for this sleeker, lighter, more agile second generation model. As before, the spec looks impressive, including an RS sport exhaust system and a sport differential. It all adds up to a fearsome performance car. The German brand's RS models are highly specialised versions of its mainstream production cars, this RS 5 based on the second generation A5 coupe and drawing on a heritage that goes all the way back to the original Audi Quattro coupe of thirty five years ago. Early RS efforts from the mid-Nineties onwards were big on grip and power but short on feel and fun factor. But Ingolstadt kept trying, finally nailing it in 2006 with an R8 supercar you could reasonably buy over a Ferrari and an RS 4 super-saloon that could take on and beat a BMW M3. That RS 4 model's 4.4-litre V8 engine was also used in the original version of this car, the RS 5 coupe, launched in 2010 and then improved in 2012. Now, we've got a second generation RS 5 with a far more credible 2.9-litre biturbo engine beneath the bonnet. Packing a mighty punch, this RS 5's 2.9 TFSI biturbo engine produces 450PS and delivers 600Nm of torque, with a charismatic soundtrack and pulling power that's available across a wide band from 1,900 to 5,000rpm. The 0 to 62mph sprint takes 3.9 seconds and with the optional dynamic package fitted, the car can reach a top speed of 174mph. Two turbochargers are positioned centrally between the cylinder banks of the 2.9 TFSI unit. The ingested air flows to the respective turbocharger and into the combustion chambers through a dual-branch system for spontaneous response. As you'd expect, the car features the latest, more driver-orientated version of Audi's quattro 4WD system. An updated five-link construction is used on the front axle. At the rear, a five-link suspension replaces the trapezoidal-link suspension used on the previous model, benefiting the deft driving characteristics and agility. It also improves comfort significantly. With the standard RS sport suspension, this MK2 model RS 5 Coupe sits much lower than the previous model. 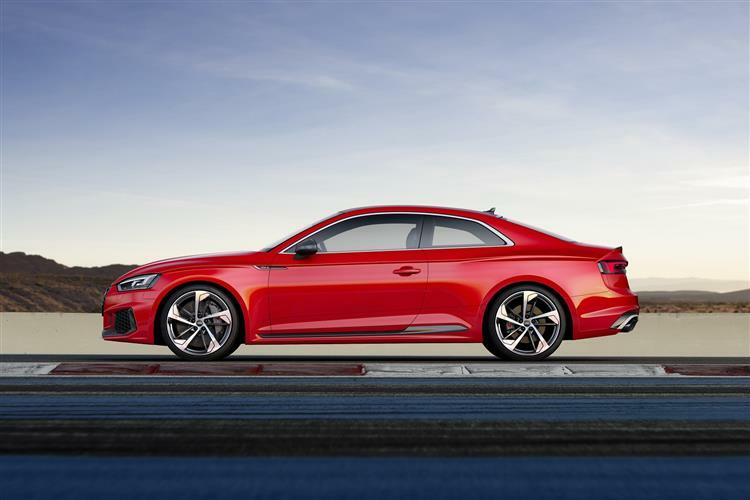 Audi Sport options include stiffer RS sport suspension with Dynamic Ride Control (DRC), ceramic brakes and dynamic steering with RS-specific tuning. Drivers can make their personal driving experience more individual, dynamic or comfortable using the standard Audi drive select system. Apparently, the designers of this car drew inspiration from the distinctive racing details of the Audi 90 quattro IMSA GTO racer. Massive air inlets with the honeycomb structure typical of RS models characterise the front end and the Singleframe radiator grille is much wider and flatter than the one used in an ordinary A5 Coupe. Tinted bezels differentiate the optional Matrix LED headlights, while quattro blisters on the flanks emphasise the pronounced bulges over the wheel arches, which have been widened by 15 millimetres.Appropriately purposeful accents are provided by the RS-specific diffuser insert, the oval tailpipes of the RS exhaust system and surface-mounted spoiler lip. 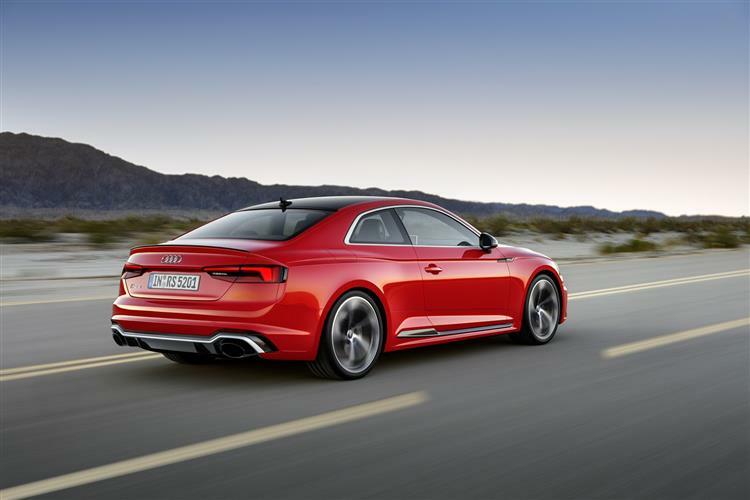 The RS 5 Coupe rolls as standard on 19-inch wheels, with 20-inch wheels available as an option. Bathed in black, the interior of the new Audi RS 5 Coupe is extremely upscale and of course is lavishly appointed. Details such as RS sport seats with optional diamond stitching in Fine Nappa leather and the flat-bottomed RS multifunction sport steering wheel underscore the character of this high-performance coupe and RS logos adorn the seats, steering wheel, door sill trims and the selector lever. Special RS displays in the Audi virtual cockpit provide information on tyre pressure, torque and g-forces. As for pricing, well think in terms of needing a budget of around £63,000 for your RS 5 coupe and you won't be far out. For that, as you'd expect, the car comes very well equipped indeed, with a whole host of 'RS'-specific trimming features, both inside and out. Plus a comprehensive range of infotainment choices is sure to keep everyone on board entertained. The optional 'MMI navigation plus with MMI touch' infotainment system includes the hardware module 'Audi connect', which connects the car to the internet via LTE. Thanks to the Audi connect SIM, which is permanently installed in the car, the flat rate data package for the connect services including Europe-wide roaming is free of charge for three years. The Audi smartphone interface uses Apple Car Play and Android Auto to make selected apps available in a separate MMI menu. Control is easy and intuitive, thanks to natural language voice control, free text search and the multifunction steering wheel. The touchpad in the centre console is used to zoom, scroll and enter characters. Further high-end technologies, such as the head-up display and as many as 30 driver assistance systems enhance safety, comfort and efficiency. 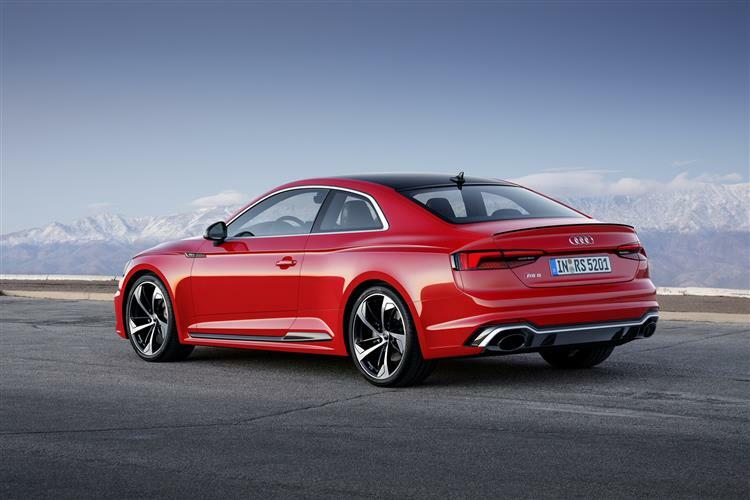 This RS 5 won't be quite as costly to run as you might expect a 450PS super-coupe to be. This is thanks to a 17% improvement in running costs compared to the previous V8-engined model. Expect 32.5mpg on the combined cycle and 197g/km of CO2, which isn't at all bad for a performance coupe with this level of performance. Apparently, the 'B-cycle combustion process with central direct injection' engineering approach used with this car's 2.9-litre biturbo engine represents a new level of efficiency among the RS models. The shortened compression stroke employed here enables an engine process with a significantly higher geometric compression ratio. Combined with a power stroke that, while normal, is longer relative to the compression stroke, so allowing for more efficient combustion and increased engine efficiency. 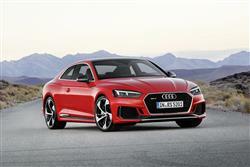 Another factor in the greater efficiency of the new RS 5 Coupe is its significantly lower weight. It tips the scales at 1,655 kilograms, 60 kilograms less than before. A carbon roof with a visible fibre structure is available as an option. The original Audi Quattro made going quickly about as easy as it could be. You didn't worry about the weather or the roads you'd be using: you simply got in the thing and went very, very fast. As you do in this RS 5 Coupe. Critics may see its approach as overly clinical, but that's a subjective thing. The hard facts are that when it comes to rival cars, a BMW M4 compromises you every time it rains. And a Nissan GT-R compromises you every time your boss checks out your space in the company carpark and tells you to grow up. Of course, if you wanted to follow his lead and get completely sensible, you'd have to admit that an Audi S5 Coupe would make more sense on paper. But the best decisions aren't always made on paper. Here's a car with a brand image built on more tactile things. And one that, thirty five years on from the original Quattro, continues a heritage of excellence.